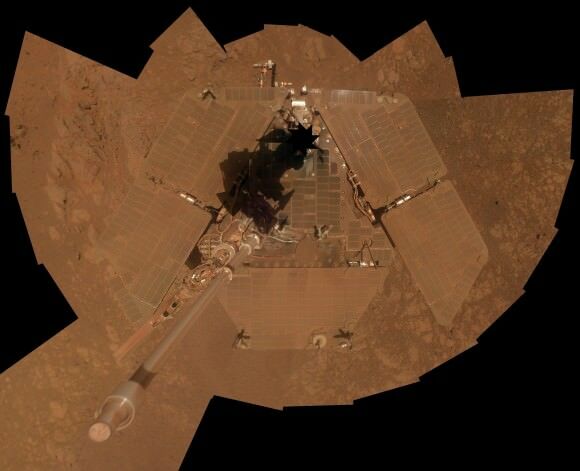 January 2014 marks the 10th anniversary since the nail biting and history making safe landings of NASA’s renowned Mars Explorations Rovers – Spirit and Opportunity – on the Red Planet barely three weeks apart during January 2004. Due to their completely unforeseen longevity, a decade of spectacular and groundbreaking scientific discoveries continuously flowed from the robot sisters that have graced many articles, magazine covers, books, documentaries and refereed scientific papers. What are the Top 10 Decade 1 discoveries from Spirit and Opportunity? Find out below what a top Mars rover team scientist told Universe Today! Ray Arvidson, the rovers Deputy Principal Investigator and professor at Washington University in St. Louis, has kindly shared with me his personal list of the Top 10 discoveries from Spirit and Opportunity for the benefit of readers of Universe Today. The Top 10 list below are Ray’s personal choices and does not necessarily reflect the consensus of the Mars Explorations Rover (MER) team. The dynamic duo were launched on their interplanetary voyages from Cape Canaveral Florida atop Delta II rockets during the summer of 2003. The now legendary pair landed on opposite sides of the Red Planet. Spirit landed first on Jan. 3 inside Gusev Crater and twin sister Opportunity landed second on Jan. 24 on the dusty plains of Meridiani Planum. The goal was to “follow the water” as a potential enabler for past Martian microbes if they ever existed. The solar powered robo duo were expected to last a mere three months – with a ‘warrenty’ of 90 Martian days (Sols). 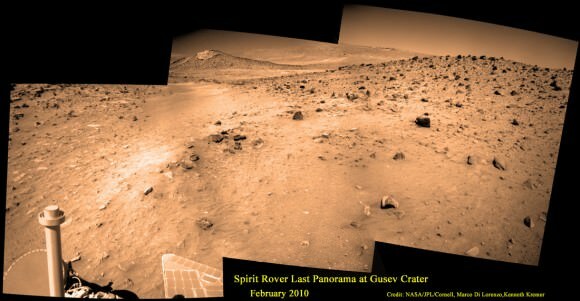 Spirit’s last panorama from Gusev Crater was taken during February 2010 before her death from extremely low temperatures during her 4th Martian winter. Spirit was just 500 feet from her next science target – dubbed Von Braun – at center, with Columbia Hills as backdrop. Mosaic Credit: Marco Di Lorenzo/ Kenneth Kremer/ NASA/JPL/Cornell University. Opportunity lives on TODAY and is currently exploring by the summit of Solander Point on the western rim of a vast crater named Endeavour that spans some 22 kilometers (14 miles) in diameter. “Because of the rovers’ longevity, we essentially got four different landing sites for the price of two,” says the rovers’ Principal Investigator, Steve Squyres of Cornell University, Ithaca, N.Y. The Meridiani plains Burns formation as sulfate-rich sandstones with hematitic concretions formed in ancient acidic and oxidizing shallow lakes and reworked into sand dunes and cemented by rising groundwaters. At the rim of Endeavour crater and the Cape York rim segment the discovery of ferric and aluminous smectite [phyllosilicate] clays in the finely-layered Matijevic formation rocks that pre-exist the Endeavour impact event. Alteration in moderately acidic and reducing waters, perhaps mildly oxidizing for ferric smectites. These are the oldest rocks examined by Opportunity and the waters are much more habitable than waters that led to Burns formation. 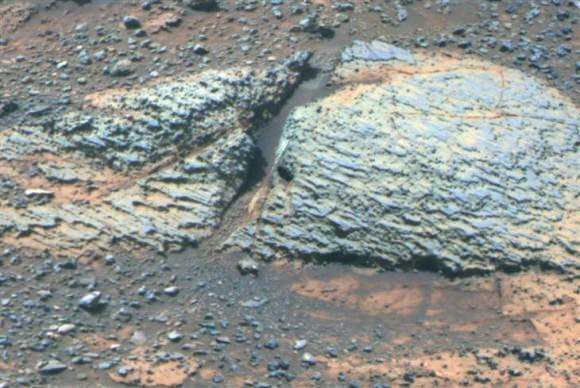 Discovery of Opaline silica at Home Plate, Gusev Crater. This formed in volcanic fumeroles and/or hydrothermal vents indicating that water was interacting with magma. The discovery of Fe-Mg [iron-magnesium] carbonates at the Comanche outcrop on Husband Hill, Gusev Crater, again showing that water interacted with magma. Note: Carbonates form in neutral, non-acid water. This was the first time they were found and investigated examined on the surface Mars during Dec. 2005. Ferric sulfates moved down the soil column by modern waters at Troy and Husband Hill in Gusev Crater. The finding [and imaging] of dust devil frequency and dynamics, showing how dust and sand are moved by wind in the very thin Martian atmosphere. Another major discovery by Opportunity was the finding of hydrated mineral veins of calcium sulfate in the bench surrounding Cape York. The vein discovery is another indication of the ancient flow of liquid water in this region on Mars. Opportunity discovers hydrated Mineral Vein at Endeavour Crater – November 2011. 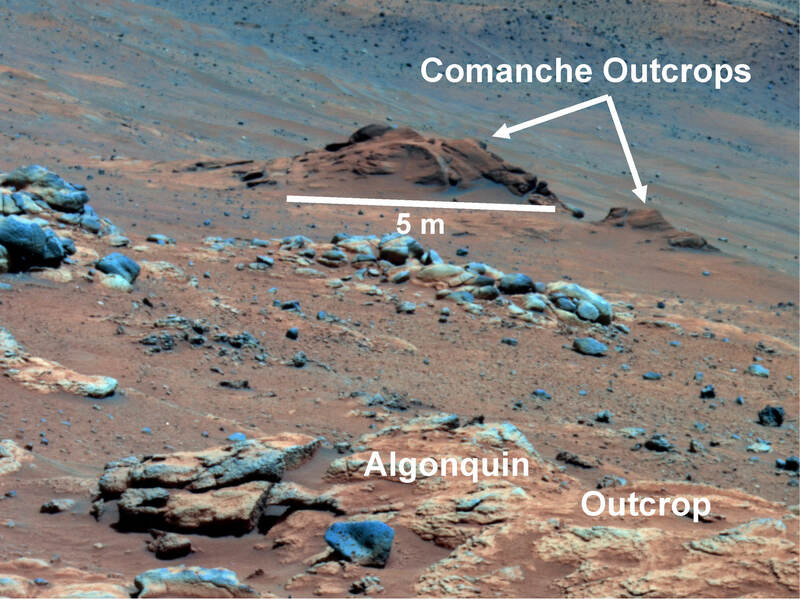 Opportunity determined that the ‘Homestake’ mineral vein was composed of calcium sulfate,or gypsum, while exploring around the base of Cape York ridge at the western rim of Endeavour Crater. The vein discovery indicates the ancient flow of liquid water at this spot on Mars. This panoramic mosaic of images was taken on Sol 2761, November 2011, and illustrates the exact spot of the mineral vein discovery. Featured on NASA Astronomy Picture of the Day (APOD) on 12 Dec 2011 – http://apod.nasa.gov/apod/ap111212.html. Credit: NASA/JPL/Cornell/Kenneth Kremer/Marco Di Lorenzo. Altogether, Spirit snapped over 128,000 raw images, drove 4.8 miles (7.7 kilometers) and ground into 15 rock targets. Opportunity is currently investigating a new cache of exposed clay mineral outcrops by the summit of Solander Point, a rim segment just south of Cape York and Matejivic Hill. These new outcrops at ‘Cape Darby’ like those at ‘Esperance’ at Matijevic Hill were detected based on spectral observations by the CRISM spectrometer aboard NASA’s Mars Reconnaissance Orbiter (MRO) circling overhead, Arvidson told me. Opportunity by Solander Point peak – 2nd Mars Decade Starts here! Today, Jan. 31, marks Opportunity’s 3563rd Sol or Martian Day roving Mars – for what was expected to be only a 90 Sol mission. So far she has snapped over 188,200 amazing images on the first overland expedition across the Red Planet. Her total odometry stands at over 24.07 miles (38.73 kilometers) since touchdown on Jan. 24, 2004 at Meridiani Planum. Read more about sister Spirit – here and here. Meanwhile on the opposite side of Mars, Opportunity’s younger sister rover Curiosity is trekking towards gigantic Mount Sharp. She celebrated 500 Sols on Mars on New Years Day 2014. What’s Ahead for Opportunity in Decade 2 on Mars ? Many more ground breaking discoveries surely lie ahead for Opportunity since she is currently exploring ancient terrain at Endeavour crater that’s chock full of minerals indicative of a Martian habitable zone. She remains healthy and the solar panels are generating enough power to actively continue science investigations throughout her 6th frigid Martian winter! Therefore – Stay tuned here for Ken’s continuing Opportunity, Curiosity, Chang’e-3, LADEE, MAVEN, Mars rover and MOM news. Previous PostPrevious Weekly Space Hangout – January 31, 2014: No Black Holes?! ?